Tossing Horseshoes: Thanksgiving Day Special: Happy Thanksgiving! Happy Thanksgiving my American friends! Living in Canada, we celebrate Thanksgiving a little earlier, the second Monday of October. But that does not mean that I can't be in a festive mood and celebrate with my American friends. I am thankful for my family and friends and their health. I am thankful for the employment I was just offered last week. Born in Bangladesh, I am thankful for the education and the lifestyle I can have living in Canada. I am also thankful for the many readers of this blog like you, there are so many things to be thankful for. What about you friends, what are you thankful for this year? Holiday, Turkey and Football. It doesn't get much better! Personally, Week 11 was a wild and successful one. My picks went 6-0 with a couple of very exciting finishes. Those games were mentally draining, but it was worth it in the end. 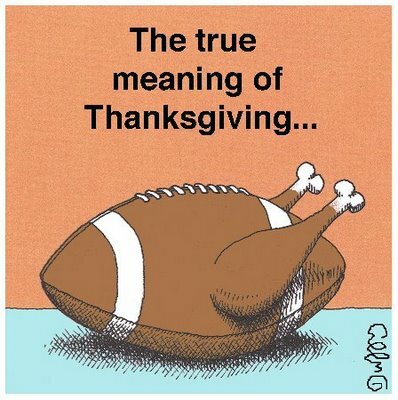 Here are a few picks for the Thanksgiving Day games that will hopefully give us more reasons to be thankful. Let's strike it rich friends! The Texans have had two tough games in the past two weeks. They must now travel to Detroit on short rest and play an early afternoon game. After their taxing overtime win against the Jaguars, the Texans will be out of gas in this match up. Additionally, the Texans are 9-1 and this game is not as significant to them as it is for the 4-6 Lions. Although the Texans have combined to rush for 1367 yards, they have been inefficient running the ball averaging merely 3.9 rushing yards per attempt (YPA). Since the bye week, the Lions defense has been able to keep them in the game and they will do so against the Texans. Detroit's performance on offense will depend on which Matthew Stafford shows up on Thursday as he has been wildly inconsistent this season. The only aspect of Stafford's game that has remained consistent is his inability to get his team out to a strong start. The Lions are involving Mikel Leshoure more prominently on offense. In his last 4 games, Leshoure is averaging 4.2 yards per rush (YPR) and has scored 4 touchdowns during that span. The Texans have been unable to to make up for the loss of defensive star Brian Cushing. Look for Mikel Leshoure to exploit a Texans defense that as been showing its holes. I am aware that the Lions are 0-8 ATS on Thanksgiving Day games since 2004. However, this is a different Lions team from the Detroit teams of the mid 2000's. Over 80% of bets are going in Houston's favor. Vegas needs a way to recover its losses and this is a prime opportunity. Don't let Vegas fool you in this match up. According to Spreadapedia, the 'Under' is 6-3 in Thanksgiving Day games involving the Lions since 2003. Moreover, the 'Under' is 7-3 on TNF games this season. Teams come into their Thursday games with wear and tear, so they are not as explosive. Add to that, both teams have played a physically and emotionally draining games this past Sunday. Both defenses are adequate. On the road, Houston is allowing a league best 179.8 passing yards and 77.0 rushing yards (2nd in NFL). On the other hand, Detroit is allowing 180.0 passing yards (3rd in NFL) and 108.0 rushing yards at home. Both offenses have dangerous weapons that can strike at any given moment. But like I mentioned above, inconsistency has plagued both offenses. Detroit has struggled to keep their passing game afloat and Houston haven't assumed their lauded rushing attack this year. The dynamic trends of this game indicate that it will be a fairly low scoring game. With a total as high as 51, I will gladly take the 'Under'. Since 2004, the 'Under' is 5-3 in Thanksgiving Day games involving the Cowboys. From my research on Pro Football Hall of Fame, the average total points scored on this holiday involving the Cowboys since 2004 is a meager 41. The 'Under' is 4-1 in the Redskins last five games. The 'Under' is 3-2 in the Cowboys last five games. RG III will once again be the focus of the Redskins offense. Contrary to their NFL rival Eagles, the Cowboys defense have earned their keep this season. The Cowboys are 10th in the NFL allowing 4.0 rushing YPA and they have only allowed 11 passing touchdowns this season which places them respectively in the Top 5. The Redskins have their own concerns on defense, especially stopping the pass. Losing Safety Brandon Meriweather hurts the defense tremendously. Washington is allowing 7.5 passing YPA (23rd in NFL) and have allowed 20 passing touchdowns (27th in NFL). Fortunately for them, they are facing the mistake prone Tony Romo. On his day, Tony Romo can be one of the best QBs in the league but more often, one of the most turnover prone. Factoring the short week and the favorable betting trends, give me the 'Under'. Thanks very much for reading and please be sure to follow my blog and share it with your friends. Good luck with your bets friends. Best of luck to you Scott, your picks look solid. I will be following you with Detroit and taking Washington along with the Patriots. 3 Different bets 1 unit each. Lets see what happens and happy Turkey day to you and your family. Thank you friend. I the know the blog description might seem confusing, but my name is Omar or Omie; no worries though. Good luck with your bets Thursday. Out of curiosity, did you get Washington at +3 or +3.5? Fading your Lions pick (Texans -3) and I have a teaser over 41 in the Dallas game w/ Over 43.5 in the texans/lions game. You seem to pick and choose your statistical patterns to justify what your picks are. How you could pick against the 0-8 Lions on Thanksgiving stat, yet justify your Under Cowboys bet on a 5-3 trend is beyond me. Thanks for commenting buddy, appreciate the feedback. When dealing with ATS or Totals, you can make an argument for either side, that's how it is set up. I decide to present the statistical patterns to convince my readers why my predictions may transpire. ==> As you may recall, the Lions team of the early/mid 2000's were terrible. They even had a 0-16 season in 2008. But they have been a team on the rise ever since. They are a much different team with newer personnel. That is why I'm not putting too much weight on their 0-8 ATS record in Thanksgiving Day games. For example: the Broncos are 7-13 ATS in November home games since 2000. Clearly the Broncos are a different team with Peyton Manning, so how much weight will you put in that trend? Not much I'm guessing. I am not comparing Stafford with Manning, but hopefully you get the idea. I have Texans-3. The 80 percent and I will be laughing to the bank. Haha, just make sure you're not eating any turkey while you laugh. It can be a choking hazard. Took the Redskins at +3 and put a small wager on the Jets at +7.5. We'll see how it turns out. Happy thanksgiving to all you Americans. Going against the public eh Sots? Good luck tomorrow! It's a fairly large teaser. I try to keep it between 2 to 4 outcomes. Still, good luck today Mark! what do you think of the under? still can cash? It's looking unlikely, but can't give up hope until it's over. Stupid Jim Schwartz! Now the under is practically dead. I think this game is swaying the public's perception about the next game. I'm sticking with my original pick. that measn u aint picking any teams but the under in dal/wash game, is that rite? I saw the line moving to +4 for the Redskins and I took them on a small bet. It's not part of my official picks, but I did bet on them just now. 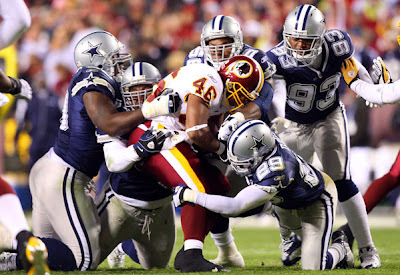 I don't think the Cowboys are good enough at home to beat the Redskins by more than 4.
buddy, btw I missed that game. It's fine. move on to next game, jets v NEP... any thoughts too? My instincts tell me Brady will want to send a message after he was less than stellar in his last game against the Jets. I have enough actions for one day so I'm not going to bet that game. But if I did, I'd bet NE. I'd feel even better if I could get them at -7.
wow, thats good. I'm hoping Det Lions would hang on and win the game for us so that I could move on to the next game. lets hope for a better outcome!! The Lions covered! I would have preferred if they won outright, but it's ok. I'm watching the next game at a bar so I won't be able to respond to you for a while TST. Nice chatting with you during the Lions game. no worries mate. keep up d gd work and lets be in touch! You watching the game TST? Even up 28, Brady throws a 40 yard bomb. The Pats want to embarrass the Jets today. Even though I went 1-2 on my blog picks today :(, managed a decent day with my bets going 3-2. It would have been sweet if you got the Redskins on time. We'll get em next time. Thanks Omie bro. Good on you and u're awesome!! Is there a way for me to be in touch with u, like PM? I don't really follow NCAAF so I can't be much help to you there. I will be posting my NFL picks though in a few hours. BAM! Great work friend. What's next is that you get a blogger account or what not and post as yourself, so we know from who these great picks are coming from. I'll be posting my week 12 picks in a couple of hours. Look forward to your picks in there.